As a result of moving slightly away from “spatial” as a core focal area in my day-to-day work at Actian.com – (I do way more with Hadoop than spatial these days), I started a new Twitter account with a less domain specific name. My original Twitter account was spatialguru – I still use it, but less often than before . Now I’m using 1tylermitchell instead. When I started calling myself spatialguru it was a bit of an inside joke around our home, I didn’t think it would still around this long. 🙂 Anyway, follow my new account if you want to see more about what I’m reading, etc. Similarly, I have tried to migrate my previous Google plus account – tmitchell.osgeo – to a new one here. Add me to your circles and I’ll probably add you to mine if you aren’t already. Now, what to do about this blog name.. hmm.. more to come. I spent the last 6 months undergoing some dramatic health changes (ping me for details), primarily diet, and now I’m getting around to refactoring my fitness. Naturally, I want to try some apps that both collect lots of sensor data but that also present it back to me in a meaningful (and hopefully motivating) way. While I’m not sure that I’d classify all the sensor data from my iPhone as a “big data” stream, it has some common attributes – in particular, that I want to keep it all and it will grow endlessly and never stop (to quote Actian’s CTO). So as I’m moving around, walking, running and more, I want to capture that. Then I want to use whatever tools I want to process, analyse and visualise it. If you’re already into fitness than you’ve already hear about the myriad of devices waiting on store shelves for you to pick up – from pedometers to bathroom scales – and strap to your persons. Internet of Things anyone? It’s not your fridge measuring energy and toaster monitoring temperature – it’s your wrist band monitoring your every footstep and your phone correlating it with your location, time of day and weather. What a great time to be alive for a data junkie working in analytics and visualisation! One of the most popular ones I hear about is MapMyFitness. You can read lots about it elsewhere. I used it to track some walks and runs, but mainly to share with a friend who does the same (keeping an eye on the competition!). I’ve used it on and off for a few years to keep track of walks and gym visits. I only used it on my iPhone and found GPS mapping was really good. I particularly like the elevation gain stats and the ability to select from past routes. Moves app on iPhone 5. I briefly tried another app called Moves and it had a really interesting interface and visualiser. All computed as automatically as possible, guesstimating where you are at (Home vs Gym) and what you are doing. It’s neat, I might try it again someday now that I’m actually doing more than just driving around. I see there are lots of other online services and apps that can read from or populate both these apps. Do you see how the line between data, application and services continues to blur. Just as the “open data” revolution has rocked governments we’ll see “open monitoring” apps rock our personal lives. Or at least thats what I’m experiencing. So I went with the Nike+ Fuelband and have found it very useful. 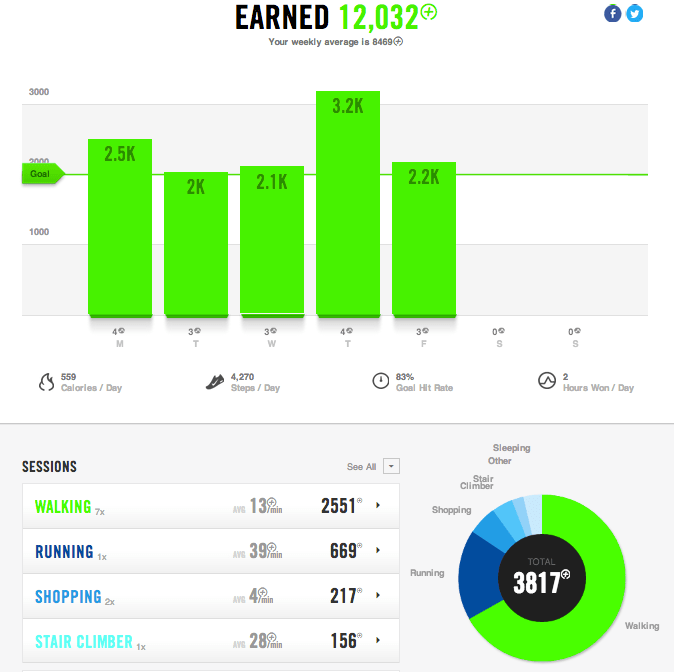 I wasn’t familiar with NIKEFUEL – a single unit measurement that sums up all your activity. It’s handy because you can compare your FUEL numbers with someone else on equal footing. It roughly converts to calories but is more of a sum-total picture. On the phone I fire up the Fuelband app and it syncs with the band and updates all my stats. The basic stats screen shows how close I am to my FUEL points for the day, while changing the colour of items to also bring the point home that I’m aiming for “green”. Other screens show how I’m doing by the week, month and year. It’s all about goals. I’ve found it recommended a good starting goal (which is still pushing me beyond what I was doing before this). And it also recommended adding additional goals when I saw that I was starting to run (i.e. Try running 3x per week). They also have various motivations throughout the app – “awards” and comparisons with others in my age bracket during the same time of day. I’m really impressed with how they’ve leverage crowdsourced stats, while also keeping them anonymised yet useful for me. I’ll show you how to can access that raw data in another post – but for now, enjoy the screenshots of their apps, knowing you can also build your own! The site includes a daily dashboard view, which is excellent – providing a good mix of high level goal achievement with meaningful visuals and links to more summarised weekly or monthly info logs. This is a very useful free service and could be worth the price of a device in and of itself. Aside from using the Fuelband app, you can also use the Nike+ Running app, along with the Nike+ site, which uses your iPhone to collect everything. More on that in another post. I’ll also give an intro to using Nike+ developer API to get access to my data! Though it’s been years since I attended a FOSS4G event, it’s getting temptingly closer to home (geographically speaking). I know several good folks down in Portland and Oregon, so can rest assured that recommending you to check it out is a safe bet. I’m sure it will be an all-you-can-eat smorg of geospatial software goodness! I came across a couple interesting packages recently for both system and app monitoring scenarios. Their “Beautiful Dashboards” slogan says it all – they have a free version of their DevOps Dashboard system for monitoring up to 3 servers. Among lots of cool stuff, I especially like how they show historic ranges in the background of charts, and flag anomalies visibly. I met some of the DataWatch team at the recent Data Viz Summit and was impressed with their tutorial on using their dashboard building tools. It all looked good and was easy to build and use – also the ability to drill-down was quite powerful as was their ability to attach to streams and perform playback. First, it’s the day that Locate Press’s second title is now starting to become available through Amazon! There are several titles in the works but this one made it past the post first. This relates also to my second item… I’ve stepped back from Locate Press over the past month to hand the leadership over to Gary Sherman. This is really good news for all our readers and future authors, because he will have more time than I did to keep things moving forward. Personally, my day job is demanding enough for me at the moment and I knew it wasn’t going to get any easier, so finding a replacement to take over the company was a no-brainer. Gary’s been involved with Locate Press from the very beginning and knows the toolchain, editorial processes and publishing paradigm just as well as I ever did. In fact, he single handedly put the QGIS Training Manual into production, which was inspiring to watch from the sidelines. I’m still around and helping where needed, but am focused on my continuing work with Actian Corp which is growing and innovating in some interesting ways – it’s a great company to being working with and I’ll share more as things progress there. By the way, with this transition, it’s a great time to pitch your new geospatial book ideas to Gary – drop him a note! Thanks for all the support I received when launching Locate Press!! How do I convert my linestring shapefile into points? It’s a common enough question on the OSGeo mailing lists and stackexchange.com. Even with the power of GDAL/OGR command line utilities, there isn’t a single command you can run to do a conversion from lines/polygons into points. Enter ogr_explode.py. I’ve co-opted the term “explode” to refer to this need and put together a simple Python script to show how it can be done. You can access it on GitHub here or see just the main guts of it listed below. Since it is a common enough need, it seems, I encourage you to fork a copy and share back.